The cat is believed to be an ancestor to the African wild cat. The cat has been living with humans from 3500 to 8000 years. There are over 500 million domestic cats world wide with approximately 146 million cats in the United States and about half are feral/unowned. In California, more than $50 million per year (coming largely from taxes) is spent by animal control agencies and shelters for cat-related expenses. Every day, 10,000 humans are born in the United States, while 70,000 kittens and puppies are born. As long as these birth rates exist, there will never be enough homes for all of the animals, resulting in the euthanization of many of them. 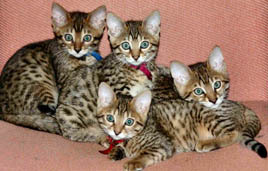 A cat can have 1 – 8 kittens 2 – 3 times a year. More then 35,000 kittens are born every day in the US with about over 1,000,000 (a million) cats are born a year world wide. Cats can see up to 120 feet away with field of vision is about 185 degrees and cannot see directly under its nose. A domestic cat can sprint at about 31 miles per hour. Cats’ hearing stops at 65 khz (kilohertz); humans’ hearing stops at 20 khz. Cats can spend up to 30% of their day grooming. The average cat weighs 12 pounds. 21% of homes in the US have at least one cat. Americans spend 4 billion dollars a year on cat food. The average cost to care for a cat for its life is $7,000.00. I think that my cats life time will go$7,000 mark because I spoil their every day of the year.